Oklahoma: I had limited trips outside of Stillwater this past week, and only was able to contact one County Educator before writing this today. Wheat around Stillwater is mostly at various stages of head emergence. I did see a few anthers on scattered heads, but not many. By contrast, Aaron Henson (County Educator; Tillman County in south-central OK) indicated wheat in his area is mostly at flowering. During this past week, I had several calls about spraying wheat with a fungicide. Although rust (stripe and leaf rust) didn’t appear to increase this past week, conditions reverted to being more favorable for stripe rust development with rainfall, increased dews, and favorable temperature. With more rains and cool temps in the forecast, stripe rust could “reactivate” again, and leaf rust will start to come into the picture. Wheat is now at the point where it will quickly move past the stage (the start of flowering) where it can be sprayed with most fungicides. As far as I know, all wheat foliar fungicides (with the exception of Prosaro) must be applied prior to the start of flowering (Feekes’ growth stage 10.5). Prosaro can be applied through growth stage 10.5.1, which is when flowering is just starting (anthers emerged mostly from the middle of heads). 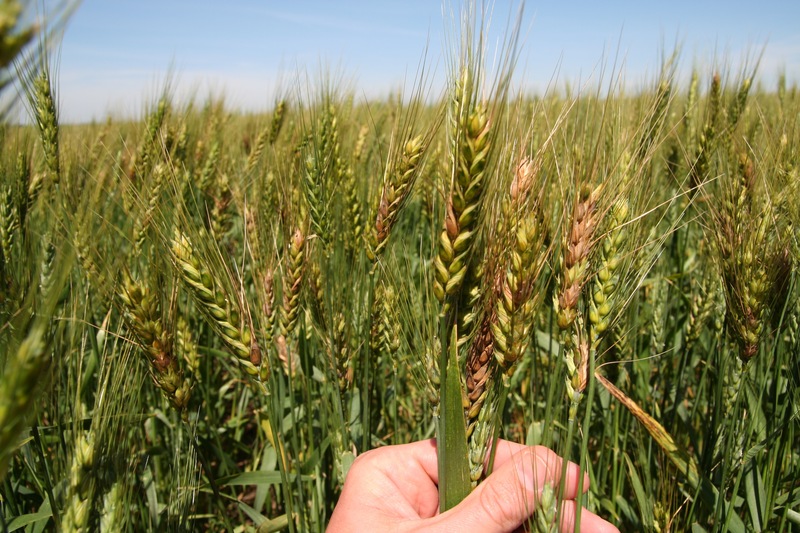 Be sure to read all labels regarding a fungicides use on wheat. There also are varying pre-harvest intervals (PHIs) required for the various fungicides, and often the length of time from heading to harvest can be short in Oklahoma. So, be aware of these PHIs, and spray accordingly. Active sporulation of stripe rust still can be found around Stillwater and the surrounding area. Stan Fimple (County Educator, Pawnee County just to the northeast of Stillwater) sent me the following photos showing active stripe rust. The photo on the top shows an actively sporulating “stripe” of strip rust (yellowish-orange in color), whereas in the photo on the bottom in the “stripes” you can see dark, blackish specks (teliospores) starting to appear. 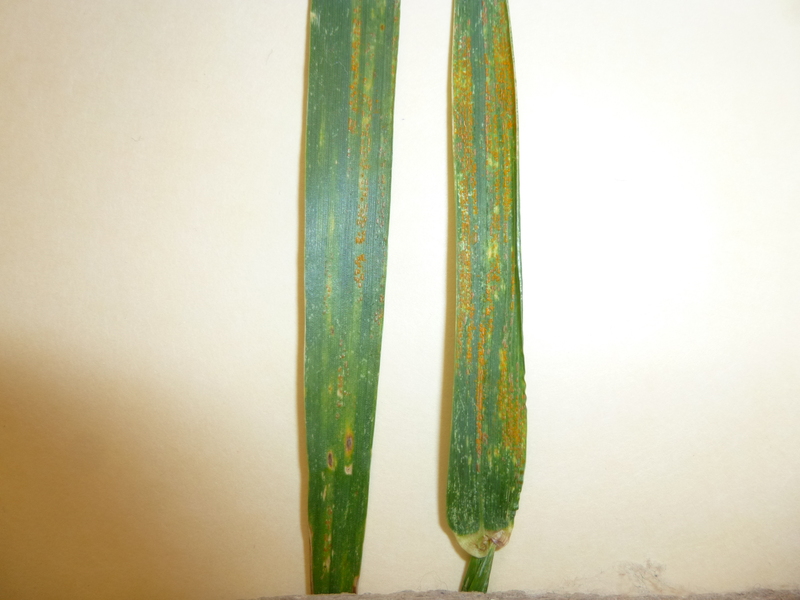 Other than this, I have seen scattered leaf rust pustules on lower leaves around Stillwater, and powdery mildew also has become more apparent around Stillwater and at Lahoma as reported by Dr. Brett Carver (OSU Wheat Breeder). However, both of these diseases are at low levels on lower leaves but with coming rain and cool temperatures both (especially leaf rust) could continue to increase on the upper canopy. Around Stillwater, barley yellow dwarf spots continue to be observed but the aphids are now gone or at least in much lower in frequency. If heavy rains come over the next 3 or so days, I would imagine aphid populations will be mostly eliminated. Finally, I want to raise awareness once again to Fusarium head blight (scab) of wheat. 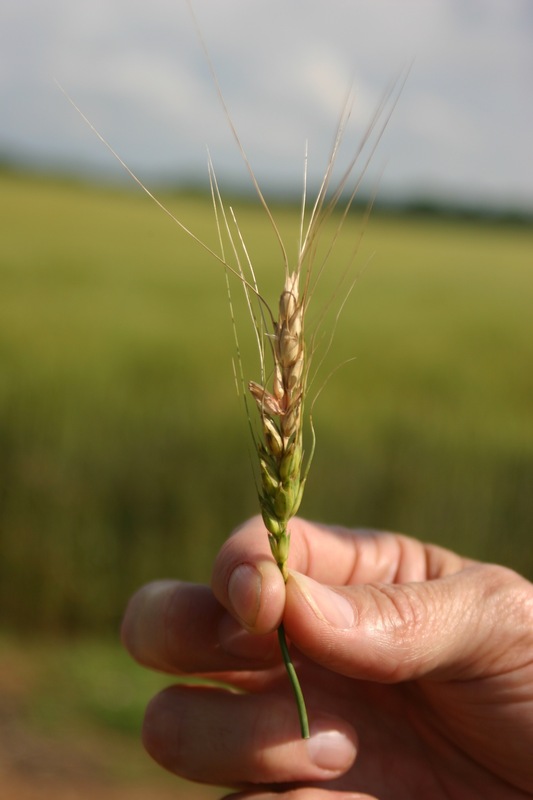 When wheat flowers it is susceptible to infection by the Fusarium fungus that causes scab. That time is quickly approaching. Occasionally Oklahoma has problems with this disease, typically more so in eastern/northeastern Oklahoma than through the central and western parts of the state. However, scab was severe across the state for a couple years around 2010 and there also was some reported last year. 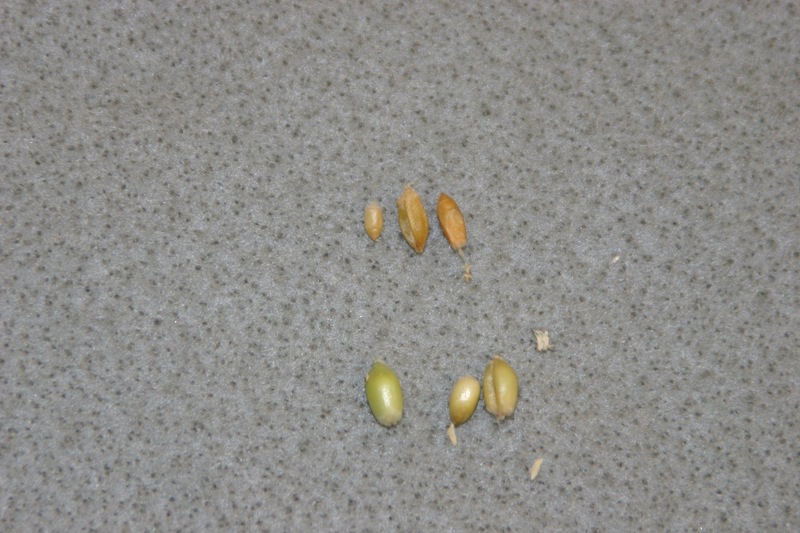 For more information on scab, please see PSS-2145 (Fusarium Head Blight (Head Scab) of Wheat: Questions & Answers) and PSS-2136 (Considerations when Rotating Wheat Behind Corn) that can be found at: wheat.okstate.edu. 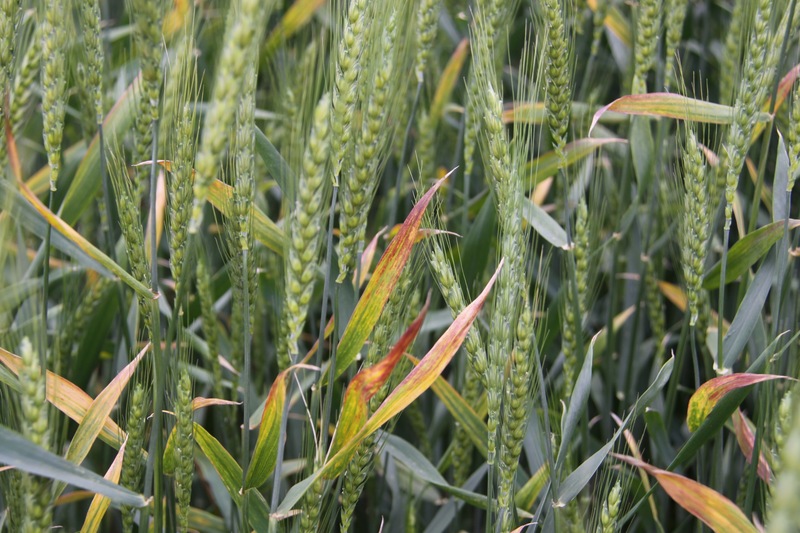 An additional resource is the Fusarium Head Blight Prediction Center at http://www.wheatscab.psu.edu/. At this site you can read commentaries submitted by specialists from each state but more importantly see if weather conditions in your area have been conducive to development of FHB. The site is easy to use and especially may be beneficial in helping make fungicide application decisions. Louisiana: Dr. Stephen Harrison, Wheat & Oat Breeder, Louisiana State University, Apr 15, 2016: My research associate (Kelly Arceneaux) is at the Rice Research Station in Crowley (Southwest) Louisiana rating plots today. 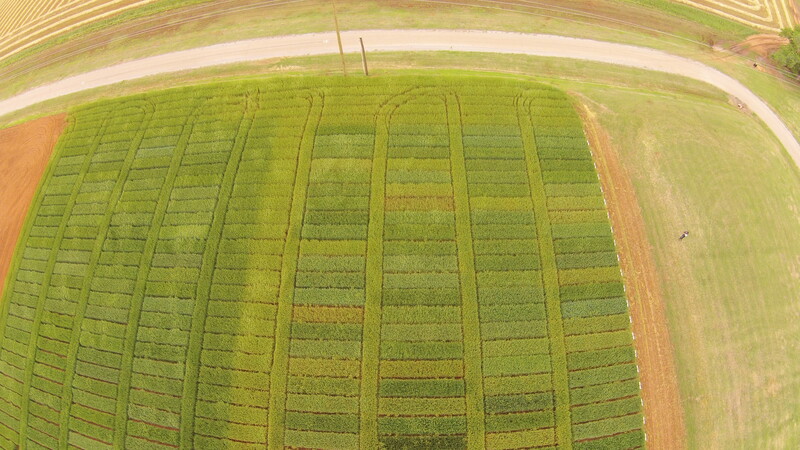 We plant a double-headrow set of a number of nurseries every year for disease screening at this location in collaboration with Don Growth (rice pathologist). This site is inoculated with scabby corn but is not misted due to the abundance of humidity and free moisture at this site. Nurseries include: Statewide Variety Trial, Uniform Southern Soft Red Winter Wheat Nursery, Uniform Southern Scab Nursery, Sunwheat, GAWN. 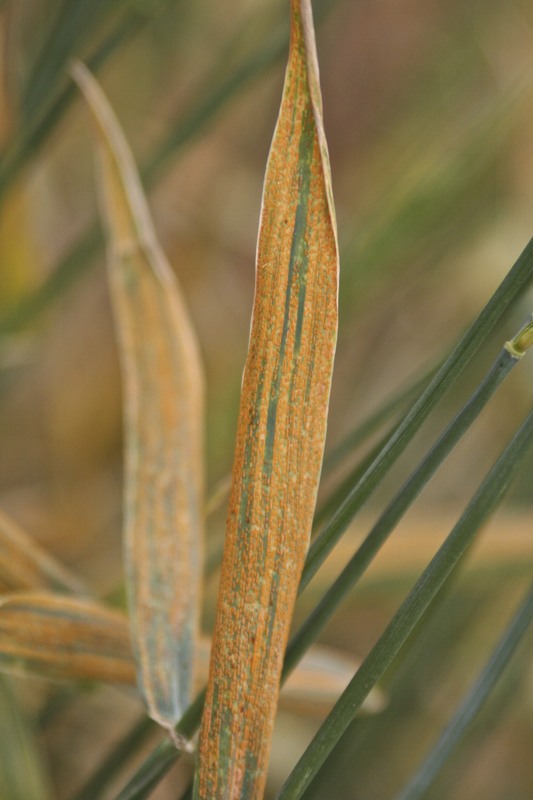 Kelly reports that stem rust is heavy and widespread at this site. 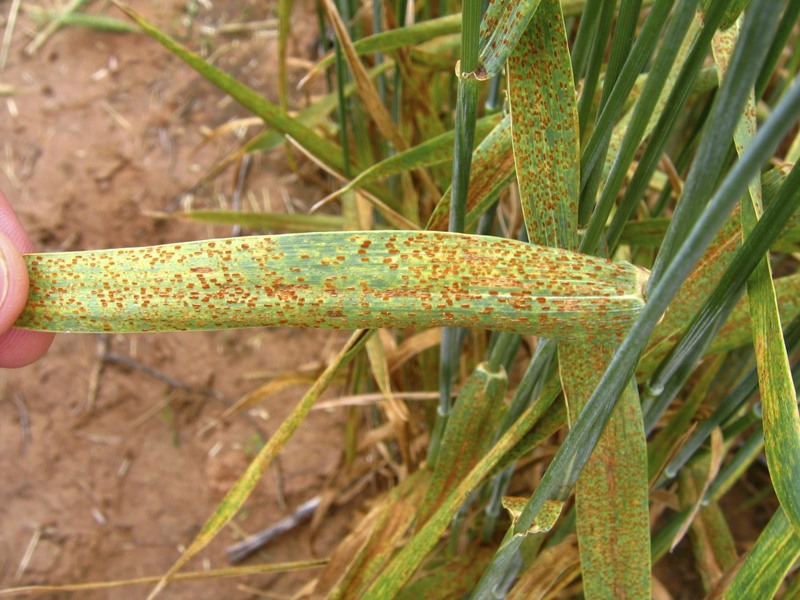 Leaf rust is moderate and scab is at an intermediate level, which is good for distinguishing lines. The earliest plots are starting to mature, probably just past soft dough, while the latest lines are just past heading or not vernalized and not going to head. We only received about 50% of our normal vernalization hours this winter and quite a few lines in the statewide variety trials will not be harvested due to vernalization issues.